Just minutes away from the bustling City of San Antonio, the abundant trees along this trail offer shade and diverse wildlife and birdwatching opportunities. Paddlers can enjoy a variety of water types including quiet pools and several small riffles. Put-in: 6890 S. Loop 1604 E.; located 3.7 mi. east of IH 37 or 4.6 mi. southwest of US 181 on S. Loop 1604 East. Alternate Mid-point Access Site: 1239 Wilson County Rd 125; located 0.3 miles northeast of FM 1303. Take-out: 15662 FM 775; located 1.2 miles southwest of US 181. PLEASE NOTE: Starting the weekend of February 4-5, 2012, the three river access sties will be open daylight hours on Saturdays and Sundays only. We will update this site once longer hours/days are available for this trail. IMPORTANT NOTE WHEN PLANNING PARKING AND SHUTTLE VEHICLES: Driving distances between access sites via FM 1303 are: A) put-in to take-out = 8.5 mi. ; B) put-in to alternate mid-point = 3.9 mi. ; and C) alternate mid-point to take-out = 5.2 mi. Although there are no man-made obstructions on this reach, there may be snags to avoid, especially when water levels are low. Heavy rains and high water can create dangerous conditions. 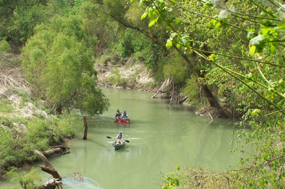 The Lower San Antonio River is a natural river that is unrestrained by flood control dams or other man-made structures. 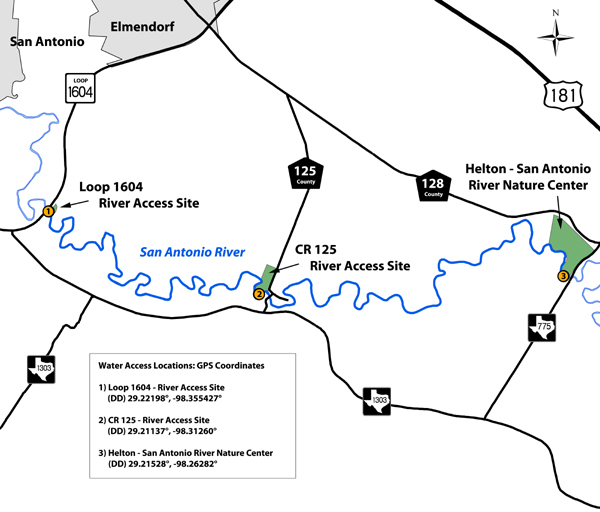 As such, the Lower San Antonio River is readily influenced by rainfall runoff that may create temporary high flows and undesirable water quality conditions. Flow and water quality information is available to paddlers on the SARA website. 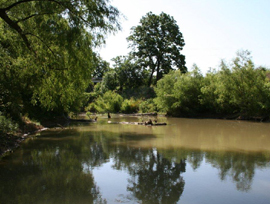 This section of the river supports several sunfish, bass, and catfish species. Small lures such as jigs, plastic worms, spinner baits and light-line are recommended. The heavily wooded riparian corridor along this stretch of the San Antonio River provides habitat for an active, diverse bird population. Birds spotted here include kingfishers, herons, hawks, phoebes, and a variety of migratory songbirds in the spring and early fall. Trees such as boxelder, cypress, cottonwood, pecan, and green ash provide shade for visitors and shelter for birds and other wildlife; to include deer, armadillo, raccoons, and squirrels. Visitors may also see feral hogs and occasionally livestock watering in the river. Visit the largest concentration of Spanish Colonial missions in North America and explore their grounds and associated agricultural sites interspersed along the San Antonio River in Bexar and Wilson counties. This newly-evolving designation retraces the 300-year old Spanish colonial “Royal Road” that passed through Bexar County and connected Mexico City with northwestern Louisiana. Historic structures and sites, along with heritage interpretation is found throughout this 28-county region, stretching from Bexar County to Liberty County. The theme of this driving trail is to showcase Texas’ struggle for independence and its years as a sovereign republic. A 98-acre nature park being developed in phases to provide passive outdoor recreation and environmental learning experiences. 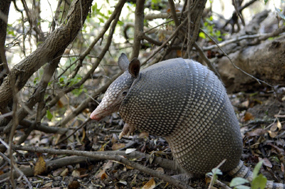 Key natural resources include large pecan groves, Calaveras Creek, and San Antonio River ecosystems. This park lies along the historic La Bahia Road, a component branch of the El Camino Real de los Tejas. 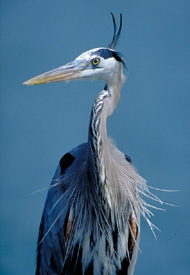 A unique 1200 acre land and water natural area that for decades has hosted both permanent and transient bird species. This 7-mile paved hike & bike trail parallels the Medina River and is resplendent with flora and fauna of the Medina’s riparian zone. This trail was made possible through a partnership between Texas Parks and Wildlife Department and the San Antonio River Authority. Rent kayaks, paddles, and life jackets; take kayak instruction classes, or reserve guided tours and group tours. All services are by appointment only. 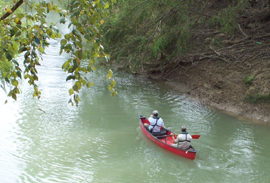 For more information, visit http://www.txpaddlesports.com or call (210)494-4200.